Summer holidays, you either love them or hate them. I am never sure about which camp I am in. 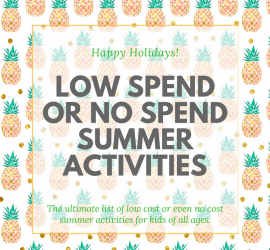 I love spending time with the children but do worry about the cost of summer activities. I relish not having to get up each morning and giving up the school routine, but I don’t like hearing the words “I’m Bored” That is why I came up with the bored jar (about four years ago). 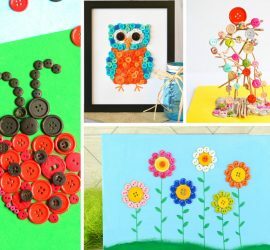 Buttons make a great craft material and these 20 adorable button crafts for kids are a great way of recycling them. There is something magical about Buttons. I remember spending hours when I was young with my Mum’s button tin. 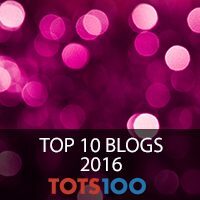 I used to sort them and play with them and just love looking at them, wondering where they had come from. Lots of them wee her mums before her. 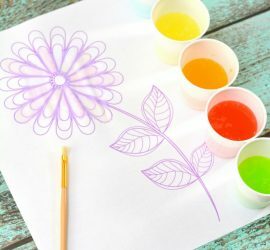 I love watercolour glue resist and we have joined in with a fantastic tea of kid and art bloggers to bring you an amazing resource. 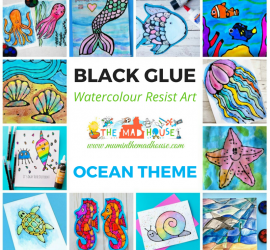 The complete under the sea watercolour glue resists Roundup. 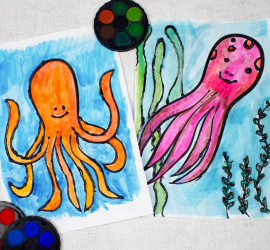 Yes, Ocean Watercolour Glue Resist Art Ideas many with free printables to make it even easier. We have been long time fans of glue resist art here in the Mad House and this octopus watercolour glue resist art project is great fun for kids of all ages. I have tailored this towards tweens by using a hot glue gun with back glue. We like using glue guns for art projects as they dry super fast and are perfect for impatient people like me! Craft sticks, popsicle sticks, lollipop sticks, tongue depressors. 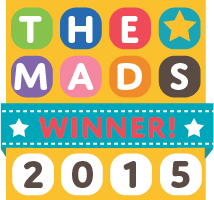 Whatever you call them they are a fabulous, versatile and inexpensive craft and art material. 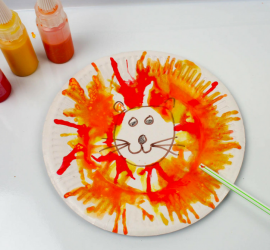 There are so many things you can do with them and to inspire you we have a super round up of craft stick crafts and activities. It really feels as though Spring might have sprung here and this plastic bottle wind spiral mobile is perfect for hanging out in the garden and watching spin as the wind catches it. 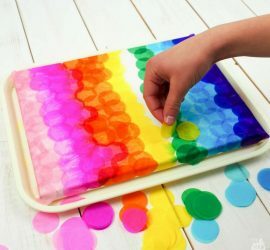 I love that it is a cross between process art and a craft and it is a great activity for preschoolers through to tweens. 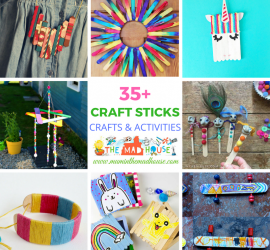 We love working with craft sticks, lollipop sticks or popsicle sticks (whatever name they go by). 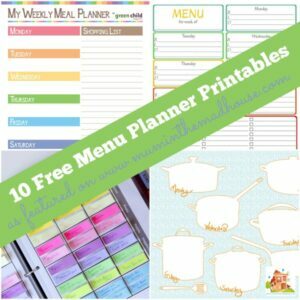 They are a fab craft material and so versatile. 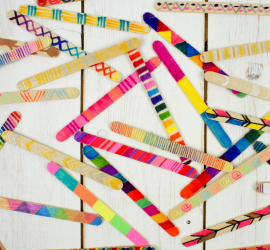 This craft stick wall hanging is a super fun collaborative art project or perfect for making over a period of time. I have to admit, I am a sucker for rainbow crafts and activities. I am not a muted palate girl at all and the colours of the rainbow really do sing out to me. 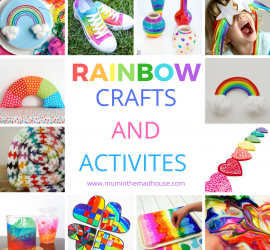 So I have gathered together some of my favourite rainbow crafts and activities for kids of all ages to share with you. 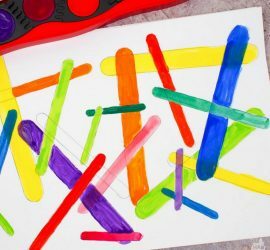 This craft stick process art activity is a super fun activity for kids and a great way to use up craft sticks, lolly sticks or popsicle sticks. 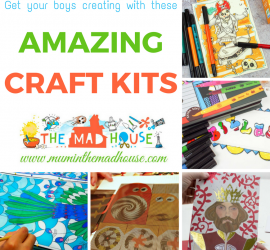 We have a big bag full of these fab craft materials in three different shapes and sizes and I love the way the boys decided to use them. We are big fans of bleeding tissue paper art here. We have even done it in the past and let rain create the art, which was great fun. This beautiful bleeding tissue paper canvas art was created with confetti circles and is fun process art activity for kids of all ages. 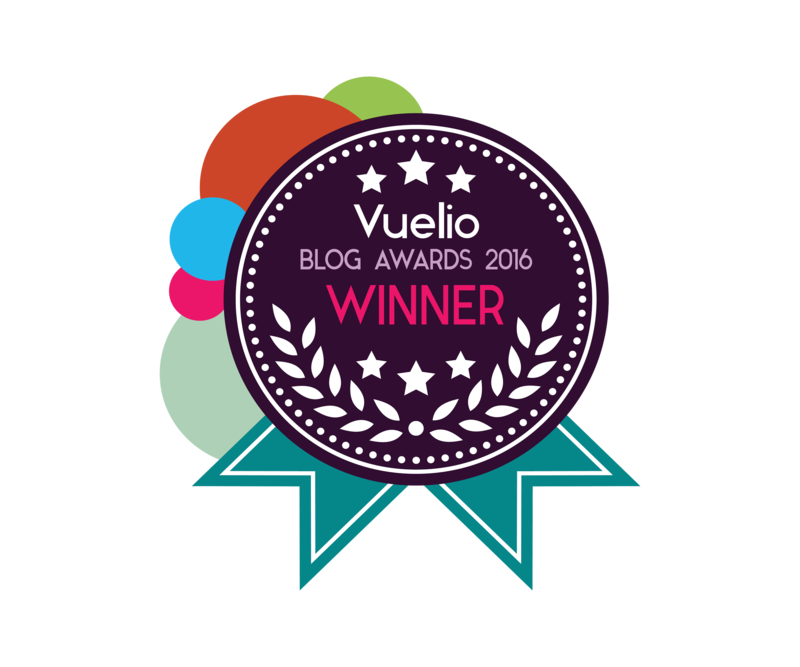 Plus you are left with a fab piece of art to display. 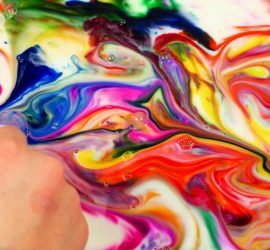 Rainbow milk marbled paper art is such a cool kids craft activity and it is great as it really is science meets art. 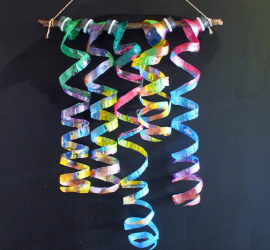 It is a classic kid’s science activity rainbow milk fireworks with the added process art activity of marbling paper. 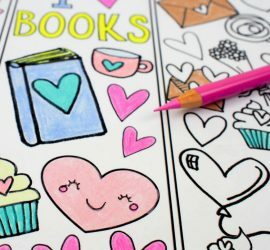 Nothing beats a good book and I am delighted to be able to share with your these delightful Love Books free colouring bookmarks. I love that I can combine two of my favourite loves colouring in and reading by making these bookmarks. These DIY craft foam stamps are super simple to make and a great way to get older kids crafting. 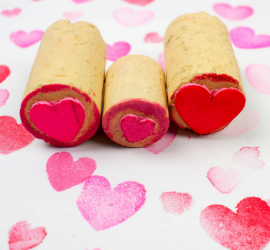 I am a big fan of upcycling ad recycling household items and making stamps is a great way of using any corks that you may have. Or if you are not drinkers then you can buy corks for crafting with. 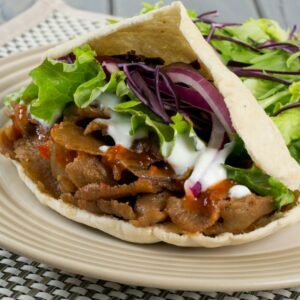 Do you love valentines? I think that once you strip away the commercialism Valentine’s day is great. 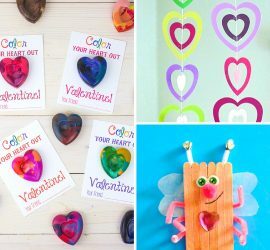 Anything that promotes love is great in my book and I am delighted to share with you over 20 Cute and Fun Valentine’s Day Heart Crafts. 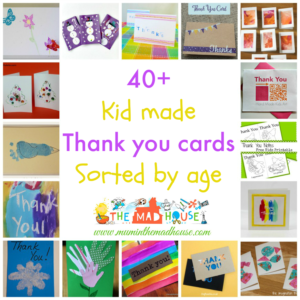 I am a huge lover of creative pursuits and getting boys involved in crafts and arts. In today’s digital age I think that being creative is even more important, but do acknowledge that sometimes it can be hard to engage your children. I have lots of arts and craft materials at home but love great craft kits. 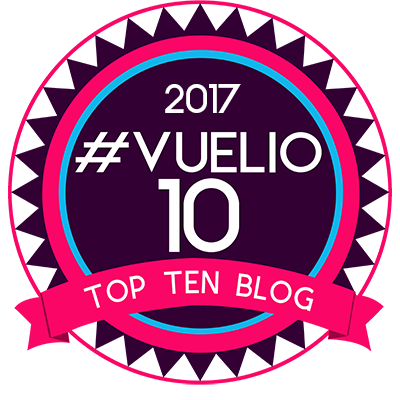 So in conjunction with Bright Minds here are my top five from Djeco. 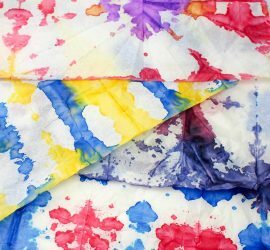 This DIY tie dye gift wrap is such a simple, fun process art activity. I have always wanted to have a go at tye dye. The closest we have got is our fabric dying with sharpies when the boys were younger. I am a big fan of unique and kid-made gift wrap, so this was great to make with them.